Boost your exposure the natural way. Do you ever wonder how some websites always come on top for specific keywords? Wouldn't you love to be on that first page? There are often millions of competitors for some keywords, and there is a great science to what it takes to be on the top. 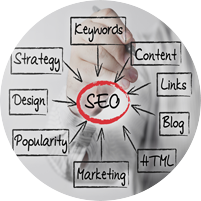 Working with our SEO team can take care of the dirty work for you and get you solid results. Natural keyword placement can be a longer process, but the reward is well worth it! Get the results you need in the time you need it! Paid search engine marketing can scare people a little bit. Realtors often think that to advertise with the 'big guys' means a 'big budget'. That often is not the case, and we're here to help get you setup to compete with whatever budget you're comfortable with. Paid search engine marketing is great for controlling your budget and helping a website get started and out there in your niche market! We can get you setup on PPC advertising with a monthly budget of your choice for a one time fee of $99. Intagent has marketing plans for any budget. Whether you are looking for a full fledged team of SEO specialists to knock the pants off your competition, or a little assistance with getting leads using a tight budget, we're here help!